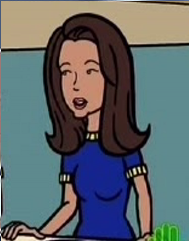 Lisa is one of the Lawndale High School cheerleaders; specifically, the one with straight and long dark brown hair. Her key moment came in "The F Word", when she was the cheerleader who decided Brittany Taylor needed to be pushed out of the group and replaced for acting weird. She went out to recruit Jane - not recognising the girl she'd been in school with for three years. She got into Great Prairie State University: the only place that would take her. She's a recurring wrestler in Lawndale Fighting Championship and given the surname Fisher. This page was last edited on 24 April 2018, at 19:39.